Photo provided by the Lib Dems Nick Clegg made a complete prat of himself today, wandering around a huge stage in a quite nauseating way, speaking without a script but most clearly not off-the-cuff, in a pale imitation of something David Cameron might have attempted. He made bad jokes, he attempted audience participation with lacklustre consequences, and the whole thing looked – at best – amateurish. In short, Nick Clegg is a complete electoral turn off, and takes himself far too seriously to attempt the tactics he tried today. It’s bizarre, in a way. Clegg is trying to argue that he wants a ‘different kind of politics’, yet is trying to communicate that message through endless hackneyed political stunts carried out badly. A walkout isn’t a walkout if it’s obviously planned, a prompt-free speech isn’t off-the-cuff when it’s over-rehearsed, and conscientiously abstaining doesn’t work under a three-line-whip. The most successful Liberal Democrat leader was Charles Kennedy, not because he was a great political operator, but because he engaged his own target audience. He pretty much shunned the traditional political ways of Westminster, and engaged in a pretty unique chat-show style that looked different, sounded more civilised, and genuinely engaged an ever-growing section of the population. Much of David Cameron’s style, such as his attempt at manufacturing a personality, comes from imitation of Kennedy, not of Blair. And yet, just as these tactics are working, the Lib Dems have abandoned them. 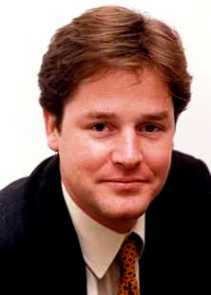 Nick Clegg is not a good Party Leader, but he could become one. He clearly needs time to grow into his new role, but there surely must be mutterings within the Party today about quite how long he should be given. Charles Kennedy, returning in a shower of glory having conquered his drink problem, may be exactly what the Lib Dems need right now. This 1,273rd post was filed under: News and Comment, Politics. Comment posted at 22:06 on 9th March 2008. I agree about Charles Kennedy: he was the strongest Lib Dem leader to date and would, if it hadn’t been for his drink problem, have probably continued to improve the party’s standing to this day.